The HiLux is constantly one of the best selling commercial vehicles in Australia, and for all the right reasons. The vehicle is nothing short of amazing in regards to reliability, value, safety and user friendliness. For a hard-working tradesman, it’s difficult to argue against the thousands who opt for a HiLux. Even though the HiLux is the ideal choice for many people, there are still some who want more than a stock HiLux can provide in terms of power. Whichever your reason may be, it is possible to get more power out of your vehicle than you already get. As is the case with most other manufacturers, Toyota also leaves room for improvement when it comes to torque and horsepower. This doesn’t mean that the HiLux is poorly made, but that it uses the most affordable alternative to it’s exhaust system. Aftermarket performance HiLux exhaust systems can unleash more power from the HiLux, and they also bear many other benefits, including sound and improved fuel economy. Moreover, performance HiLux exhaust systems are made of durable stainless steel or aluminium, materials which are not susceptible to heat, thus increasing the gas flow in and out of your vehicle. The interesting thing about aftermarket performance exhausts is the fact that they increase performance and power in an interesting fashion. Granted, it won’t deliver the same amount of performance increases as a supercharger or turbocharger will. It will however, deliver a noticeable amount of performance by reducing back-pressure, getting more oxygen into your vehicle and reducing throttling and pipe expansion from heat. By getting more oxygen into the engine, you allow it to “breathe” more freely, and the rate at which your engine burns fuel is improved in a sense that it’ll require less fuel to run your vehicle. Even though the improvement won’t be astronomical, you’ll still notice it, especially if you go for a full-exhaust replacement rather than just an axle-back or cat-back replacement. 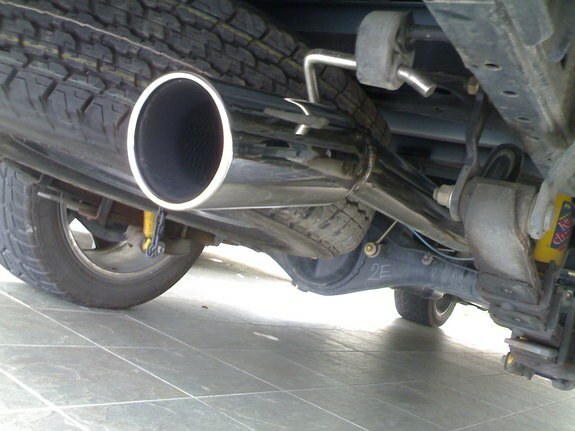 When searching for a performance exhaust, you should think about how you use your vehicle most. Typically, aftermarket exhausts add to the appearance and sound of your vehicle, with highly polished mufflers and larger tips, you get a more aggressive, refined look. Not all exhausts add to the appearance, but instead only alter the way your HiLux sounds. There are aftermarket mufflers that provide a deep, aggressive growl.